Established 13 years ago, Kingdom Structural Steel Ltd has grown to become a leading provider of farm buildings in the South-West. Founder and managing director Tim Sheehan explains more. 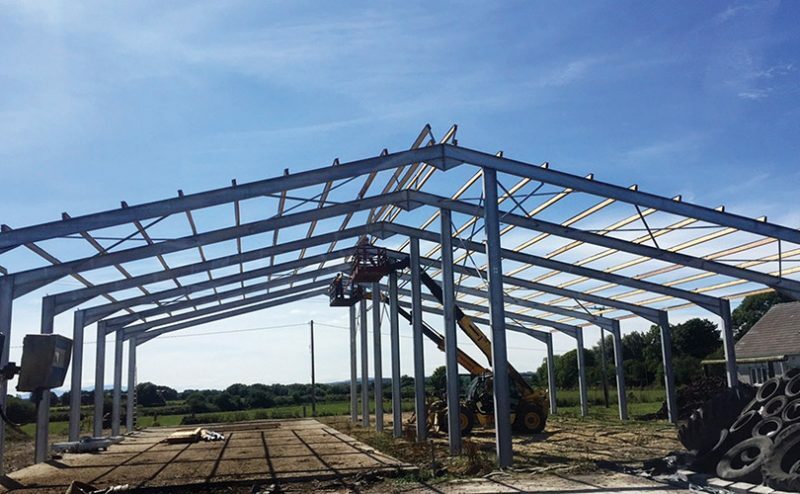 Operating from a modern premises in Kilflynn village, which is half way between Tralee and Listowel in North Kerry, Kingdom Structural Steel is a one-stop shop for all your farm building requirements. It also specialises in the fabrication and erection of structural steel for the industrial and commercial sectors. While Kingdom Structural Steel may be a relatively new company, its owner Tim Sheehan has a wealth of experience in the business. Forty-eight years to be exact! “I’ve worked in this business for a long time and know it better than most,” he explains. Boasting a growing customer-base in counties Kerry, Cork and Limerick, Kingdom Structural Steel is a family-run business which has earned an enviable reputation for quality, reliability and value-for-money. Tim is joined by his son Paul, sister Anne and first cousin Tim Flaherty in the day-to-day running of the company. Of the 10 staff that are employed, six are steel erectors and three are steel fabricators. “All of our staff are highly qualified and have been with us from day one. They take great pride in their work and have a great rapport with our customers,” Tim says. Kingdom Structural Steel can fabricate and erect any size of building to your design, or assist you in designing it to suit your needs. If you prefer to erect your own shed, the company can cut and supply fabricated steel and accessories to order. As an agent for Tegral sheeting, Kingdom Structural Steel stocks a wide variety of Tegral grant and non-grant approved sheeting. Timbers, gutters and fixings are also supplied and fitted. In addition, Tim and his team can make aluminium, stainless steel, galvanised guttering and flashings to order. The company can also carry out welding and machinery repairs in its workshop. A full welding service is provided. Tim supplies and fit buildings to your design in single skin non-drip cladding or Kingspan insulated panel. Only the very best products go into making a Kingdom Structural Steel building! “The steel we use is graded and certified, the timber is imported and stamped, while Tegral and Kingspan supply the cladding. Everything we use is of the highest quality,” Tim continues. While farm buildings account for around 80 per cent of Kingdom Structural Steel’s business, the company also fabricates and erects many industrial and commercial units each year. Examples include: Dairymaster, Causeway; Transmission Links Ireland, Abbeydorney; Fitzgerald’s Hardware Store, Dingle; Shaw’s Department Store, Tralee; Family Resource Centre in Listowel; ESB Power Station, Moneypoint. Kingdom Structural Steel is a certified supplier of CE marked structural steel to the requirements of EN 1090 up to and including Execution Class 2 (EXC2) which covers the fabrication of all farm buildings and structural steel used in general construction. Since July 2014, under the Construction Products Regulations (CPR), it has been a legal requirement that fabricated structural steelwork delivered to construction sites must be CE certified. “Anyone who isn’t CE certified shouldn’t be in this business. A farmer can’t apply for grant aid if he or she is not dealing with a CE certified company,” Tim points out. Tim and his staff are committed to providing a top-quality product and service at the most competitive price. All of their buildings are solid, secure, attractive in appearance and are built to last a lifetime.